Do you need a fancy fan cover with precisely specified attributes, but have no desire to design one from scratch? If you answered yes (or no) then [mightynozzle] has the answer. The Customizable Fan Grill Cover is a parametric design in OpenSCAD that allows adjusting the frame style, size, and grill pattern for any fan cover one may possibly need. [mightynozzle] also went the extra mile to provide a large number of pre-made STL files for a variety of designs in a wide range of sizes, so those who don’t want to fuss with customizing can simply download and print. Normally Thingiverse would allow customizing this model’s attributes with their built-in Customizer, but the functionality and availability of that feature is spotty. Luckily it’s always an option to download the source and do the customizing directly in OpenSCAD. For those who may be intrigued but are not sure where to start, here’s a reminder that we covered how to make a thing with OpenSCAD that demonstrates the whole process. This will come in very handy so, thank you. 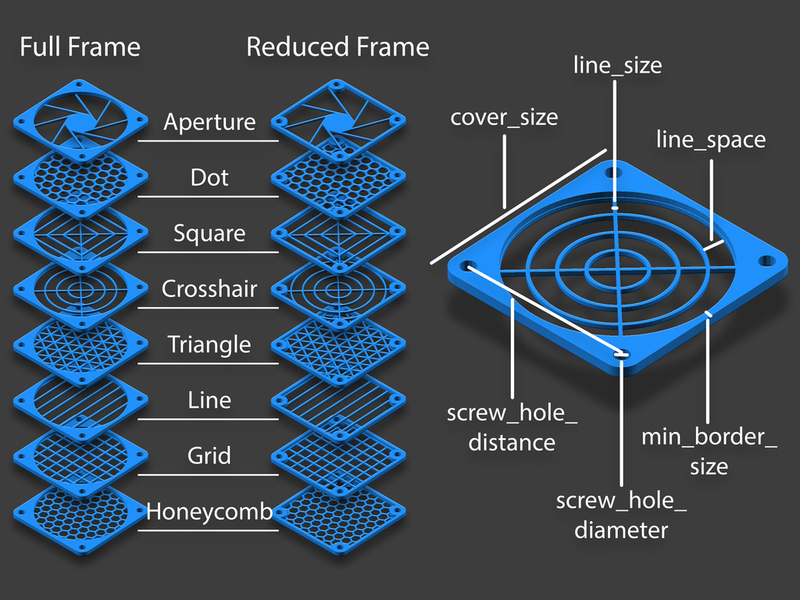 So, I see what different size holes gets you … but what do the other variations help with? Indeed, fan grills can be responsible for a lot of fan noise. Choose & mount carefully. For those who want to (re)model with openSCAD, but don’t want or can’t install the software, there is an online version which lets you work from the browser http://openscad.net 3dviewer included.